Set at the site of an 1865 Civil War skirmish, Morrisville was originally named after Jeremiah Morris who donated land to the North Carolina Railroad for a depot, water tower and other buildings. The town grew as a result of the rail line and continues to grow in population due to its close proximity to Research Triangle Park – one of the largest research parks in the world. 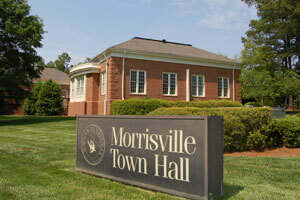 Morrisville boasts a diverse community with top ranked schools and activities for all. Residents and visitors can visit the Observation Park at the Raleigh Durham International Airport for views of the runways and air traffic control tower, visit Triangle Rock Club – the Southeast’s largest indoor rock-climbing facility – or enjoy shopping, dining and entertainment at one of the town’s many newly appointed mixed use developments. The annual East Meets West Festival celebrates Morrisville’s diverse population each May with food, culture and music from around the world.